Figuring out what exactly your fountain nozzle needs to achieve the height you are looking for is perhaps the more tricky know-hows in fountain making. At first glance, reading the fountain nozzle flow charts may be a bit confusing at first, but a brief explanation should clarify the matter quickly. We will use for example the bronze aerating fountain nozzle above for a quick reference. Take a look at the chart below. You will see the 2 sizes for the bronze aerating fountain nozzle. The first issue you want to determine after you settle on the size of your nozzle is how high you want your water to spray. lets take a look at the one 1" fountain nozzle here. If you want that nozzle to spray the water up 6 feet in the air you will need a pump that can do 15 GPM (Gallons per Minute or 900 Gallons Per Hour GPH) at 11 foot head. here is where most people go wrong in their calculations. They see 900 gallons per hour and say ok that is the pump I have or need to buy. NO SO!! What you will need is a pump that can give you 900 gallons per hour at 11 feet up. To put it another way, if you were to get a pipe and raise it 11 feet up vertically your fountain pump has to be able to deliver the water to the top of that pipe and still be able to generate 900 gallons per hour. In this example we have a 2100 GPH pond pump that will do the job here for one nozzle. If you want multiple heads to do the same thing, lets say 3 heads you will need 2700 GPH at 11' head. In this case we have a 3200 GPH pump that will do the job for all three. NOW, this would be a minimum. Other factors such as if you have the fountain pump a distance away from the fountain nozzle, or if you are using elbows in your plumbing, will reduce the flow, and thus you will need to make up for that with a larger pump. In many cases unfortunately you will have a pump and really not know its flow curve. It is something that you will normally only find on the box of your pump or its instructions if at all. 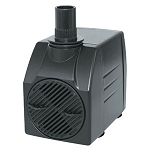 Furthermore, not all pumps are created equally, so you may have a 3000 GPH pond pump that can give you 900 GPH at 11 feet, but there can be another brand of pumps that can only do 700 GPH. In other words, do not look at one flow chart of one brand of pump and assume that will apply to your pump. Lucky for you however we do have flow charts for almost all of our pumps, so determining what fountain pump you will ultimately need should be easy with us. Of course you can also always give us a call or email us with questions and we will be happy to help.